This life size foot model demonstrates whole anatomy of the foot & is useful for any one studying. The human anatomy or for doctors to explain the problems to the patients. Material : Imported PVC and paint. - Demonstrate all the foot functionality and the external anatomical structures. Mounted on stand. We provide Foot Joint model for various research purposes. Demonstrate all of foot functionality and the external anatomical structures. Including flexible, artificial ligaments. Made of PVC plastic, Natural size. Demonstrate all of foot functionality and the external anatomical structures. Including flexible, artificial ligaments. Made of PVC plastic. Natural size. · Demonstrate all of foot functionality and the external anatomical structures. Including flexible, artificial ligaments. Made of PVC plastic. Natural size. Made of PVC Plastic, life size on stand. 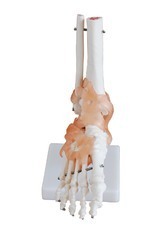 Demonstrates all of foot functionality and the external anatomical structures. Including flexible, artificial ligaments. Made of PVC plastic. Natural size. 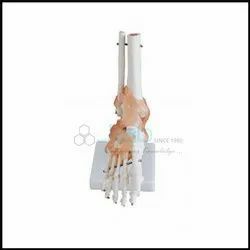 We are offering for Life Size Foot Joint. life size shows the shapes and correct origins and insertions of biceps & triceps . biceps and triceps are made of flexible material , external and flexion can be shown as well as the antagonist . relationship of these two muscles . on base. Demonstrate all of foot functionality and the external anatomical structures. Including flexible, artificial ligaments.